Some of my favorite companies and publications are headed by female founders who check in with their audience regularly, and it’s something I’ve always admired and enjoyed. With the end of Q1 upon us, I thought I’d chime in, say hi and give a little life update as we move into the second quarter of 2019. As most of the best things in life do, Curry’s foray into our family happened quickly and unexpectedly. From our morning routines, to our daily schedules and of course our budget, she has single-handedly rocked our world. But more than house training, commands and which puppy foods haven’t been recalled, Curry has taught us a hell of a lot about staying patient, present and intentional. Instead of hitting snooze, rolling out of bed, leisurely sipping our coffees and diving into work on our own timeline, our mornings now start much more strategically. We wake up with our first alarm, relieve her from her crate, take her outside, feed her breakfast and take her for a walk. The rest of our day is spent tag-teaming her lunch and dinner schedules and making sure she spends a sufficient amount of time outside. This has required a major mindset adjustment on my part, and the responsibility to get much more acquainted to one of the things I’m not so great at: break-taking. Long gone are the days when I could set up shop for hours and immerse myself in my work without realizing hours had passed at my regular coffee shop. Long gone are the days when I didn’t have to schedule my meetings and work hours around another living creature’s needs and wants. On that same token, Curry is the reason I’m spending measurably more time outside. Now, I know all of my neighbors by name, and I’ve learned more about my neighborhood over these past few weeks than I had in the past few years living here. With Curry, we’ve made new friends at the park (and have certainly increased our vitamin D intake). She has quite literally been a breath of fresh air, and neither of us can quite fathom how we ever lived life without her. I’m not writing this to persuade you to rescue a pet (or am I?) This is mostly just a personal reflection re: how quickly these big ~*adult*~ milestones can change things. I knew Curry would be an undertaking—especially considering her age and breed—but I didn’t know the impact she would have on my working life in particular. Here’s hoping (and knowing) that just like every season and adjustment, this one will get easier as time goes on. In the meantime, I’ll be enjoying all of the puppy cuddles, accepting caffeine by carrier pigeon, and marveling at all of the women out there who are somehow taking care of not only pets but also raising tiny human children, too. Talk about babes who hustle. Chelsea is a Florida native with a background in writing, integrated marketing and competitive dancing. She currently works full-time in the environmental infrastructure industry and part-time in the real estate development industry in addition to running the show here. She holds a B.A. 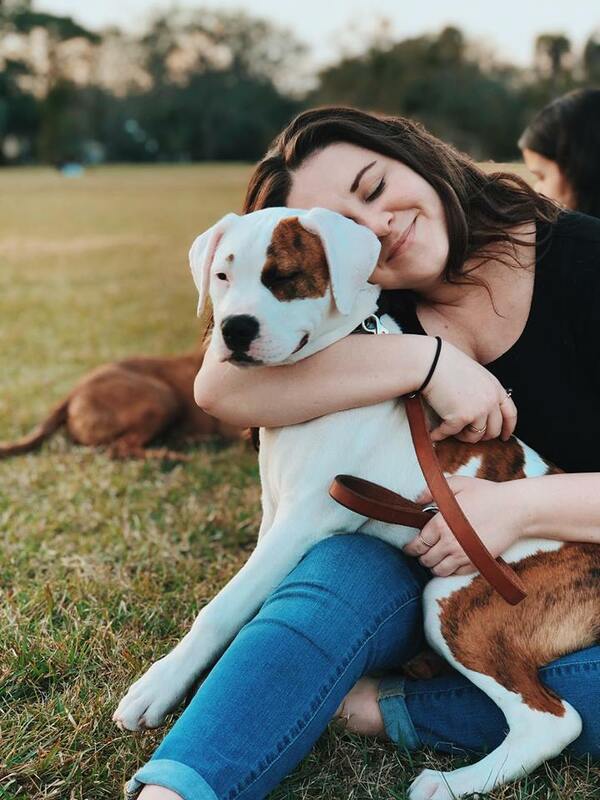 in Editing, Writing & Media from Florida State University and lives in Jacksonville, FL with her partner, Matt and her pup, Curry.